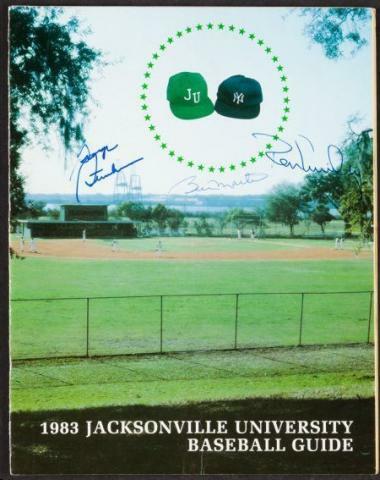 From the 1983 preseason, this is a Framed Program from an exhibition game played between the New York Yankees and Jacksonville University. 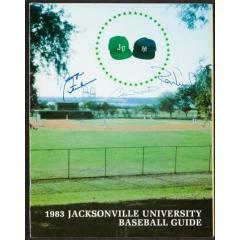 What makes this item so special are the authenticated autographs that grace the front cover. Hall of Fame pitching ace Ron Guidry, fiery manager and legendary Yankee Billy Martin and franchise owner George Steinbrenner all added their signatures to the cover of this very unique piece of historic memorabilia. Already framed for preservation and presentation, it's a nice addition to any collection that will look great hung on any wall in your home or office. It comes with a Full Letter of Authenticity from James Spence Authentication. Due to the unique nature of this item we must charge your credit card for the full amount immediately upon taking your order. This policy ensures we reserve the signed program for you. We will confirm your order by Email. Please allow at least 2 weeks for delivery.